their workers better in order to fend off unionization. Finally, benefits that union members won for themselves—like the eight-hour day, or weekends off—often ended up percolating down to other workers. These days, none of those things are true. ….Even though unions remain the loudest political voice for workers’ interests, resentment has replaced solidarity, which helps explain why the bailout of General Motors was almost as unpopular as the bailouts of Wall Street banks. And, at a time when labor is already struggling to organize new workers, this is grim news. In a landmark 1984 study, the economists Richard Freeman and James Medoff showed that there was a strong connection between the public image of unions and how workers voted in union elections: the less popular unions were generally, the harder it was for them to organize. Labor, in other words, may be caught in a vicious cycle, becoming progressively less influential and more unpopular. The Great Depression invigorated the modern American labor movement. The Great Recession has crippled it. I can’t envisage unions ever getting their mojo back in the US private sector. At the same time, however, I can envisage a world in which the pendulum of power starts swinging back towards labor and away from capital. What I’m very unclear about is how that’s going to happen….If the era of the union is over, as it seems to be, what other countervailing force will work to preserve the value of labor? Good question! And one that’s very much on my mind lately. But not one that I have any answer to. Public sector unions are a lot like that: conservatives don’t like them in the first place, and crippling them would also seriously cut into a major funding source for the Democratic Party. It’s another twofer. And as Surowiecki notes, they’re a ripe target right now. 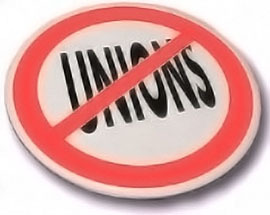 Conservatives succeeded spectacularly over the past few decades in destroying private sector unions (and doing considerable damage to the Democratic Party in the process), and this means that most people no longer belong to a union or even know anyone who does. Unionism in general, then, simply has very little public support these days. With that as background, it’s pretty easy to understand how a recession would fuel growing taxpayer resentment toward public sector union benefits they’re paying for. The next few years are going to be rough ones for public sector workers.